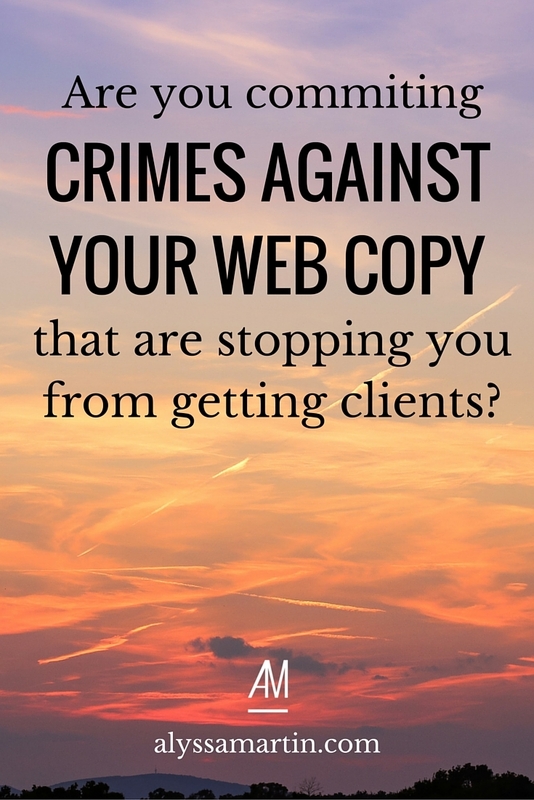 Are you committing these crimes against your web copy that are stopping you getting clients? You can have a killer service & deliver game-changing results for your clients, and still fail to attract more of them. The differentiating factor is often whether your website is geared towards turning visitors into clients. The harsh truth is that you can be the best in your industry, but if you don’t write & talk about your work in the right way, your dream clients won’t know how you can help them. You’ll find it harder to convince people to work with you & your business growth will be snails-pace slow. These 6 copywriting crimes are probably going to be doing you more harm than good, no matter how good you are at your work. Luckily, they’re an easy fix. And if you want to take your messaging up a notch so that your web copy becomes a client magnet, join me in the From “ho-hum” to “um, Whoa!” — 4 day Memorable Messaging Training. Click here for more info. Now, are you committing these crimes against your web copy that are stopping you getting clients? Your website is NOT about you. Your website is about your dream clients. They need to arrive on your site & quickly realize that they’ve found their online haven – a safe space created just for people like them. Have you ever had a conversation with someone at a party that talked too much about herself? No doubt, you walked away thinking that woman was not interested in me at all. It’s an awful feeling. Do you want your dream clients feeling that way about you? Definitely not. You want them to feel safe & at home. If the words I, me, my, we, our, ours appear more often than the word YOU, you know you’re in trouble. It’s a foolproof way to tell if you’re talking about yourself more than you’re talking about your dream client & their needs. Think about when you’re tossing up between buying 2 different recipe books. When deciding which one to buy, do you care about the fact that Book 1 teaches you to cook on the grill, while Book 2 wants you to bake in the oven? God no. Who the hell cares how you cook it, right? You only care that it’s delicious when cooked. That’s because the process is not as important to us as the outcome. I don’t care what design program my designer uses to create my graphics; I just care that they look good. I don’t care what modality my healers use to heal me; I just care that they make me feel better. I don’t care what order my business coach teaches me all her knowledge; I just care that she helps me grown my business. See how that works? Don’t get caught up on the process that you forget to explain what’s in it for me & the value of your work. This is one of my pet peeves. Don’t be so arrogant as to talk about yourself in the third person. It’s weird when you do it in real life; it’s weird when you do it online. Just stop it. Even worse, it creates distance between you & your dream clients. Instead of your web copy being a story that connects you & I & makes me want to hire you, it becomes me reading about some far off, distant person that is separated from me by a narrator. Writing about yourself in the third person is a surefire way to erode trust. I rant more about this over here. Do people know this kind of service exists and do they want it? That question is the most underrated secret to online sales. If you know your dream client’s mindset before you even start writing, the messaging & web copy you create is going to be so much more aligned with what they already think & feel about services like yours. Naturally, you need to know everything you can about your dream client, short of what they eat for breakfast. But their mindset is the biggest, most important thing for you to know when writing web copy that’s going to appeal to them & have them falling over themselves to work with you. Knowing why I’m in business has been one of the biggest turning points for me. Everything started to fall into place once I got clear on my Big Why. It’s what drives my offerings, how I interact with my clients & what results I want to achieve with them. That’s juicy stuff full of value for my clients, which needs to be reflected in my web copy so that I attract people that want what I deliver. Your dream clients want to know, like & trust you – and a big part of that is knowing that you share similar values or have a shared mission. Your Big Why is a big connector. It connects you with clients, collaborators, & mentors, so make sure it’s a prominent part of your messaging. It’s so easy to be afraid of being more visible in your business, of standing out from the crowd, of zigging when they expect you to zag. This fear manifests in a whole bunch of mindset blocks that stop you from promoting your work with a loud, proud voice. But what you don’t know when you’re trapped in that fearful place is that it’s safer to be bold – to speak your truth & do truly amazing things in your business. Without that boldness, your message fades into the background – and with it, your business & your profits. Because not standing out is the same as being invisible. So I hope this post has been helpful for smashing some mindset blocks around how you talk about your work! If you’re struggling to loudly & proudly talk about your work, be sure to join me for the “From “ho-hum” to “um, Whoa!” — 4 day Memorable Messaging Training.” It’ll help you get clear on how to find the right words that will make your business more meaningful, memorable & profitable in 2016.